In addition to our sneakboxes, we also offer Nissan Outboards and Load Rite Trailers. We can offer package deals at a substantial savings, and also can offer all different models of motors and trailers by themselves. For many years, Nissan Marine outboards have been known to be some of the most dependable outboards by experts—from highly respected marine editors, to experienced mechanics. All Nissan outboards are equipped with premium, heavy-duty crankshafts, bearings, connecting rods and pistons. Through-the-prop exhaust system makes them quiet running, while the corrosion- resistant stainless steel water pump housing ensures clean, even cycling. Nissan's five-layer corrosion protection - successive layers of zinc chromate primer and a durable enamel finish that inhibits corrosion in the harshest marine conditions - now includes clearcoat. Standard CD electronic ignition gives lightning-fast starts. The most important reason to buy an outboard is dependability. And no one combines technology and dependability like Nissan Marine! At Nissan Marine every Nissan outboard you buy is backed by 50 years of engineering focused only on building the most dependable and durable motors on the market. We carry a variety of Nissan models, each one as dependable and durable as the next. All models 4hp and above include forward, neutral and reverse gears, easy-to-control tiller handles, and composite propellers. The 2 and 3.5hp models feature 360° steering with forward and neutral gears. Safety-stop switch and lanyard-mounted cutoff switch are standard. 2 and 3.5hp come standard with plastic prop. If weight is one of your major concerns, Nissan's featherweight 8hp and 9.8hp outboards make no compromise when it comes to the dependable operation Nissan has become famous for. 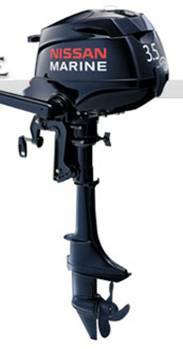 Nissan Outboard motors are the perfect companion for our Classic Barnegat Sneakboxes. Their light weight and compact size are tailor made for the small sneakboxes. And don’t let their small size fool you. These small, but powerful outboard motors are the reason why Nissan Marine leads the industry in the small horsepower class. If weight is one of your major concerns, Nissan's featherweight 8hp and 9.8hp outboards make no compromise when it comes to the dependable operation Nissan has become famous for. 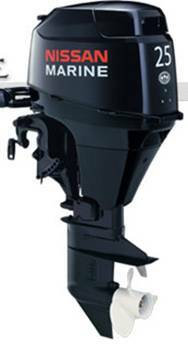 The 6/5/4/3.5/2 series of outboards deliver dependability in an easy-to-use, light and compact package. The 3.5 hp and 2 hp are fully equipped with features essential for portable outboards such as the throttle grip on the steering handle, 360 degree full pivot steering, and an easy-to-use carrying handle. In addition to package deals and motors for our sneakboxes, we also offer a full line of Nissan outboards at extremely competitive prices. Also, we are a full line Nissan Dealer. There are many other models, sizes and options not shown here. Contact us for a quote, no matter what your needs.